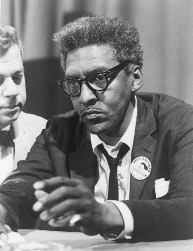 Civil-rights activist Bayard Rustin (1912-1987) will posthumously be awarded the Presidential Medal of Freedom at a White House ceremony later this year. In anticipation of the 50th Anniversary of the March on Washington, President Obama will posthumously award the Presidential Medal of Freedom to labor, civil and human rights activist Bayard Rustin. Rustin and Brotherhood of Sleeping Car Porters President A. Philip Randolph were the lead organizers of the iconic March on Washington for Jobs and Freedom that took place on August 28, 1963. Hundreds of thousands of Americans participated in the march, and the nation listened intently that day as Martin Luther King, Jr. delivered his “I Have a Dream” speech from the steps of the Lincoln Memorial. Rustin, who was openly gay, was often in the shadows of more visible civil rights leaders like King, but had his hands on many of the most important civil rights battles of the 20th century. A 1941 march on the Nation’s Capital he helped organize was only called off only after President Franklin D. Roosevelt gave in to Rustin’s demands of ending employment discrimination in the defense industry. In 1964, he led a one-day student boycott of New York City public schools to raise awareness of its lackluster desegregation efforts – over 464,000 schoolchildren stayed home. President of the A. Philip Randolph Institute Clayola Brown called on Americans to carry on Rustin’s legacy as the country approaches the March’s 50th Anniversary. “If Rustin were here today, he would be standing shoulder to shoulder with our sisters and brothers in the labor movement, civil rights movement, women’s movement and LGBT movement pushing us further, telling us we have not done enough,” Brown said. The IAM will be joining thousands of labor, civil rights and community activists at the 50th Anniversary March on Washington on August 24, 2013. Click here for more information on how to get involved.